after japan, i had a craving for north american food. 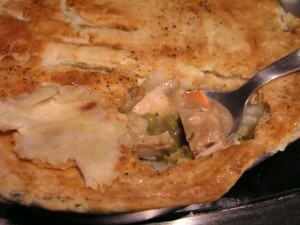 so, with doozer’s help, i made chicken pot pie very similar to this recipe. differences: instead of cream, an oil/flour roux to thicken. no pearl onions on hand. lesueur canned petits pois instead of frozen. seasoning with dried cilantro and a dash of paprika instead of parsley. 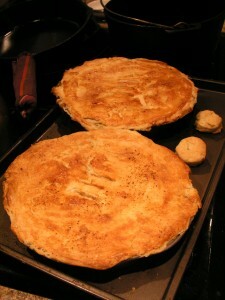 and i used her pie crust 102 recipe – no vodka, just butter, all by hand, took all of 5 minutes to prep, honest injun. the results were outstanding, if a bit high on the fat scale. slightly over half an 8″ pie later, i’m stuffed…the rest will be a great lunch tomorrow. also, the little pastry biscuit was a delicious appetizer. suddenly, puff pastry seems achievable! oyster patties are in my future, i think.